PV Evolution Labs and GTM Research tackle the need for comprehensive and comparative reliability metrics for the PV industry. 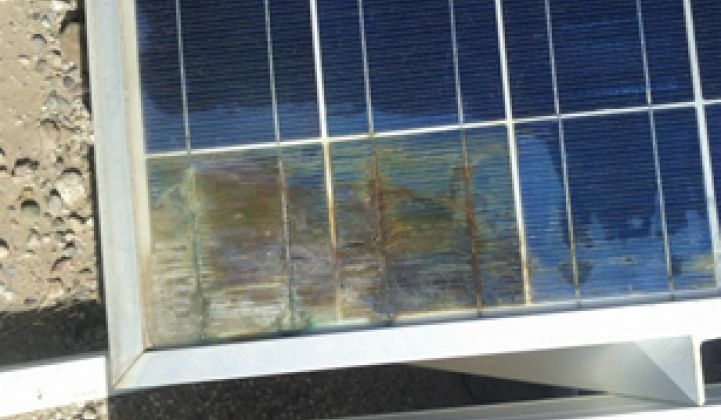 Not all PV modules are created equal. While as an industry, we like to hold our data under lock and key, we've all heard anecdotal stories of underperforming systems, large warranty claims, negative investor returns, and even the occasional fire. While many believe that PV modules are a commodity, hundreds of suppliers are competing for a crowded pipeline, each with slightly different materials, balance sheets and processes. The supply-demand imbalance has brought us to a point where manufacturers continue experiencing unprecedented downward cost pressure and their balance sheets remain strained. These days, PV module customers are buying a product, rather than a 25-year relationship with a stable supplier. Developers, EPC firms, banks, and insurance companies are instituting sophisticated supplier qualification and ongoing quality monitoring programs to mitigate the risk of underperforming panels. Effective diligence can include reliability testing, evaluation of energy yield, third-party .pan files, and factory audits. Unfortunately, few PV module buyers have the resources to properly keep up with qualifying suppliers, especially with the fast evolution of the products they're buying. Whether its Taiwanese cells or cast mono, lower cost encapsulants or backsheets, or "PID-free" modules, products are changing fast to keep up with costs and to differentiate in a crowded field. Increasingly, PV module buyers depend on their suppliers to provide reliability test results to support their claims. Unfortunately, because there are no industry standard reliability tests, each manufacturer has its own interpretation of reliability testing, leading to industry confusion. And unless the test reports are provided by a credible third-party lab, PV module buyers must also take this supplier-provided data with a large grain of salt. Of course, since I’ve never seen a prospective supplier indicate that its panel isn’t the absolute best-in-class model of long-term stability, what is a PV module buyer to do with biased apples-to-oranges reliability test reports? GTM Research has teamed up with PV Evolution Labs to provide the industry’s first PV Module Reliability Scorecard. PV Evolution Labs, a leading technical advisor to the downstream solar industry, performs reliability and performance evaluations of PV modules utilizing their state-of-the-art laboratory in Berkeley, CA. In this ongoing program, manufacturers from around the world undergo a comprehensive and rigorous side-by-side testing program where products are evaluated for their response to real-world stresses such as temperature swings, humidity, freezing temperatures, UV radiation, system-level voltage stresses, and mechanical fatigue. In a process that pushes the boundaries of what’s required by current industry standards, modules are tested according to the stringent PV Evolution Labs Reliability Demonstration Test, developed in partnership with the National Renewable Energy Lab and Sandia National Labs. The results of these tests will be analyzed by PV Evolution Labs and GTM Research to produce a competitive scorecard that will enable manufacturers to build and maintain their bankability, and enable banks, developers and EPC firms to enhance their supplier qualification and product due diligence programs through competitive reliability metrics. Details of the PV Module Reliability Scorecard program will be unveiled at Solar Power International next week, where manufacturers will learn about the product submission criteria, how their modules will be tested, and how the data will be utilized by the industry. PV Evolution Labs has recently launched a robust PID certification program which evaluates a panel's sensitivity to elevated voltage stresses. Several suppliers have been evaluated to date; however, only Suniva and Canadian Solar have successfully completed the program. Many others are currently undergoing PID evaluation. 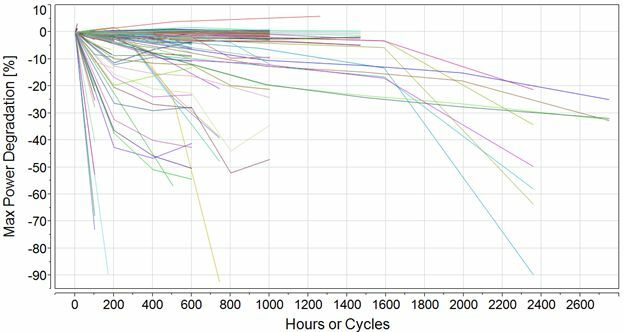 The chart below shows more than 200 PV modules recently subjected to a variety of reliability tests at PV Evolution Labs. This snapshot clearly indicates the wide spectrum of panel performance in reliability testing. An unbiased apples-to-apples comparison of different prospective suppliers is critical to supplier qualification decisions. PV Evolution Labs has been providing third-party reliability test reports to manufacturers to build up their bankability story, and this new PV Module Reliability Scorecard now offers developers a sophisticated technology-neutral analysis that places module products on an even playing field for the most accurate comparison. A first-of-its-kind benchmarking program aimed to strengthen current industry standards by measuring and comparing PV module reliability across multiple manufacturers, the PV Reliability Scorecard program will launch its first testing cycle this fall. To reserve space in the program or be added to the waiting list, manufacturers can visit http://www.pvel.com/.